The 1870s saw a continuing intrusion into the sacred Black Hills of present-day South Dakota by gold-hungry white men, and settlers who coveted the area's rich soil. The situation spurred a succession of Indian uprisings led by Lakota (Sioux) chiefs Crazy Horse and Sitting Bull. In 1876, the U.S. Army commenced a major campaign against them. However, failures against the warriors culminated in the infamous Battle of the Little Big Horn, during which Lieutenant Colonel George A. Custer and a column of his Seventh Cavalry soldiers were annihilated. It was, however, a Pyrrhic victory for the Indians. A new and determined group of army columns took to the field that fall, and the capable general Nelson A. Miles won important battles against the Indians. The latter were compelled to sue for peace, then sign a treaty calling for them to relinquish their rights to the Black Hills. The majority of the Lakota went off to live on reservations west of the Missouri River. Even Sitting Bull and his band, who had fled to Canada following the Little Big Horn battle, returned to the South Dakota region in 1881, after a promise of amnesty. They settled on Standing Rock Reservation, in 1883. In 1890, a spiritual movement spread among the Lakota. This militant trend, dubbed the Ghost Dance, was inspired by a Paiute from Nevada called Wovoka. Army authorities worried that the Ghost Dance would ignite another Lakota uprising. On November 12, 1890, the Pine Ridge reservation agent wired the army to send help after witnessing Indians dancing wildly in the snow. Major General Miles responded with 5,000 men. They included the Seventh Cavalry, brought up to strength with new soldiers. The army dispatched Indian police to apprehend Sitting Bull, but he put up a struggle and was killed. Several hundred of Sitting Bull's Standing Rock band fled to the Cheyenne River reservation, the home of Big Foot's Miniconjous. Shortly after, Red Cloud requested that Big Foot bring everyone over to Pine Ridge to keep clear of more trouble. Miles, however, misread the passage of Big Foot's swollen numbers and ordered the Seventh Cavalry to catch up with them. Under the command of Colonel James W. Forsyth, the regiment apprehended the Standing Rock Hunkpapas and Big Foot's Miniconjous near Wounded Knee Creek on December 28. The soldiers ordered the 350 men, women, and children to set up camp to stay the night. Four Hotchkiss artillery pieces were positioned to overlook the camp, ready to fire into it in the event of trouble. The soldiers planned to disarm the Indians the following day. More guns were found, and one of them discharged; it is not known who pulled the trigger. The soldiers immediately swept the Indian camp with a hail of repeating rifle and artillery fire until at least 150 of the Lakota, of both genders and all ages, lay dead. Another 150 wounded Indians were taken to Pine Ridge's Holy Cross Episcopal Church. Government physician, Charles A. Eastman, attended to the wounded. 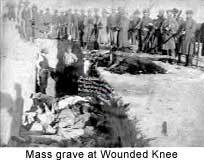 The Wounded Knee massacre was the final major confrontation between Indians and white men on the Northern Plains. Bury My Heart at Wounded Knee: An Indian History of the American West by Dee Brown. In the Spirit of Crazy Horse by Peter Matthiessen. Oh What a Slaughter: Massacres in the American West: 1846--1890 by Larry McMurtry.